I hope you all had a wonderful holiday season. I am working on challenges and here is the first one I have ready to post. It is for the challenge over at Artistic Inspirations, be sure to stop by and see what the talented DT has for your inspiration. The image is from Stitchy bear. I used Cricut bubbles embossing folder for the background and colored the image with Spectrum Noir markers. I have to make time to do some refills on a few of them. Thanks for stopping by and leaving your comments. It's great to hear from you. Have a happy crafty day. Very cute! I love the background. Oh so sweet! Thanks for joining in at My Time to Craft! This is fabulous, such a cute image. 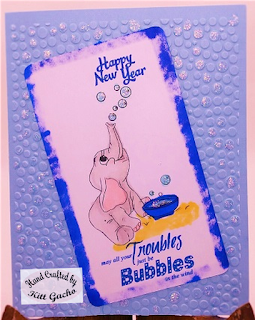 Cute card :-) Thanks for joining us at Creative Corner Challenges.